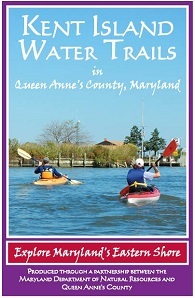 Kent Island Water Trails in Queen Anne’s County was developed through a partnership between Maryland DNR and Queen Anne’s County. This guide was designed for field use, is printed on waterproof paper, and details six different water trails in the Kent Island area. The guide, originally printed in 2010 has been updated and reprinted in 2014.The trails provide a wide variety of paddling experiences so there are options for all levels of expertise. Also included is information on the fees and regulations required to access the county’s public landings and boat ramps, GPS locations, and amenities at each access points.